There are many in America, who are acting as if they were surprised to see what decision the Supreme Court would come out with concerning a redefinition of marriage. This decision was brought about by 9 attorneys who are unelected by the people. The courts have shown once again their utter disregard for the republic and the rule of God’s moral law (Common Law) by advocating what God clearly condemns (Leviticus 18:22, 20:13; Roman 1:24). These injustices are acting outside of their scope of authority, as well as engaging in anything but “good behavior.” It is the duty of the judges to discover and apply, not to legislate from the bench. Their recent decision regarding redefining marriage to include sodomites has never occurred in the history of mankind! So, what is it really all about? Look to Canada. What is even more amazing to me is the fact that the 78% of the American people who call themselves Christians apparently do not even know what The Bible declares! It is amazing to see what they tolerate (1John 2:4). Furthermore, to allow the Supreme Court to rule by oligarchy is illegal. They are allowing less than 1.6% of the population to dictate “law” to everyone else. This is the same court that voted to allow the murder of the innocent in the womb, calling it a woman’s “choice” (Proverbs 6:17). Friends, she should have been impeached and indicted right then and there, according to Article 3, Section 1 of The United States Constitution. America, from where is the Supreme Court deriving all of this unconstitutional power from? They are doing it based on the ignorance of the American people! Americans are still under the delusion that the Supreme Court justices are appointed for life, and that whatever the Supreme Court decides is going to be the law of the land. That’s completely wrong! Did you know that in many schools across the country, you were required to pass Bible courses before you could graduate high school? All the way up until 1962, prayer was the norm for virtually every school in America and the Ten Commandments were posted in school hallways. In other words, the Supreme Court helps to advocate the crime rather than prevent them (Psalm 19:11). The Supreme Court has a lawful obligation and duty to execute judgment upon crime, not to encourage it (Isaiah 51). This is the same court that has transgressed its delegated authority over and over again (Psalm 94:20; Isaiah 5:20; Psalm 2). The new Supreme Court seems to be set in place to destroy rather than preserve. 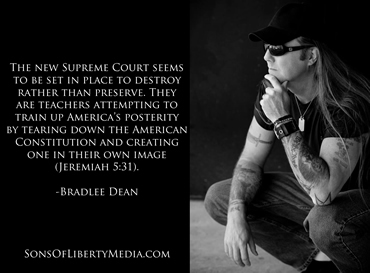 They are teachers attempting to train up America’s posterity by tearing down the American Constitution and creating one in their own image (Jeremiah 5:31). How about 9 corrupt judges? Interestingly enough, over the head of the Supreme Court building in Washington, D.C. there is a huge engraving of Moses with the Ten Commandments in his hands. The inscription under Moses states, “Justice the Guardian of Liberty.” Our founders have laid in stone a truth that reproves those who sit in the Supreme Court chambers this day, and it would serve the American people well to do the same.